High Times: The Doors of Perception, the title of a book Aldous Huxley wrote after taking mescaline in the 1950s, is a term that perfectly describes any exploration of human consciousness. Rocker Jim Morrison could dig it. So could Richard Alpert and Timothy Leary, Harvard University psychologists who began stepping through those doors with Huxley in 1961 as fellow travelers on numerous LSD trips. Morrison died in 1971, the same year Alpert  by then renamed Baba Ram Dass by an Indian guru  published Be Here Now, the countercultures guide to all things transcendental. Director Oliver Stone memorialized the Lizard King in a 1991 feature film, The Doors. Ram Dass Fierce Grace, opening this weekend at the Savoy Theater in Montpelier, is Mickey Lemles fascinating, touching 2001 documentary about a man whose wise perceptions have inspired generations of fellow spiritual seekers. In his personal break-on-through-to-the-other-side experience, Ram Dass almost reached the end when he suffered a major stroke in 1997. Though he still battles partial paralysis and difficulties with verbal expression, the septuagenarian remains quick-witted despite long lapses when he speaks. Ram Dass was also always exceedingly bright. Beginning with his precocious childhood in a well-heeled New England Jewish family, Richard Alpert was destined for conventional success. That all changed when he joined forces with Leary, whose openness to new ideas and his willingness to take wild risks in thinking made him a stimulating colleague. Had the pair merely stuck to wild thinking, they might not have been fired from the university in 1963. But by that time, their experiments with acid  designed to combat recidivism among prisoners and to help divinity students see God  had breached the boundaries of scientific inquiry. Ram Dass tells the filmmaker his own intake of hallucinogens became tiresome, especially because of the inevitable drop after a drug high. I saw that going up and down wasnt satisfying, he says. When the endearingly silly flower-power era ended, Ram Dass continued his mission by helping inmates find spiritual growth during their incarceration. He also developed the Dying Project, a program for coping with death and grief. 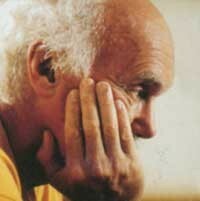 Ram Dass looks thunderstruck. Yum, yum, yum, he remarks, in what seems to be a stroke victims equivalent of yes, yes, yes. He sobs. He exhales deeply. Boy, thats strong, he says of her nocturnal vision. They cry together and hug. Your soul has intuitive understanding of this path, he tells Abby, and its clear Ram Dass also has been blessed with insight about making his own way through this troubled world.